The New England Golf Association (NEGA), established in 1926, is a 501(c)3 amateur golf organization comprised of leaders from the six New England golf association - Connecticut, Maine, Massachusetts, New Hampshire, Rhode Island, and Vermont. With a mission to service the golf community in the region, the NEGA's primary purpose is to conduct the following premier championship events: The New England Amateur Championship, the New England Senior Amateur Championship, and the New England Junior Invitational. Each year, the New England Golf Association conducts three championships proper showcasing some of the best amateur golfers from across the region. Additional, we host seven sectional qualifiers in order to determine the field for both the New England Amateur Championship and the New England Senior Amateur Championship. In its 89th year, the New England Amateur Championship is one of the largest and most prestigious regional golf championships in the country, comparable to the Sunnehanna Amateur, Northeast Amateur, and Terra Cotta Invitational. The 72-hole stroke play event hosts a field of 156 competitors. In 2017, the NEGA introduced a sectional qualifying round to ensure the top competition advances to the Championship round. Premier venues have included clubs such as Winchester CC, The Country Club, Worcester CC, Wannamoisett CC, Portland CC, Portsmouth CC, The Course at Yale, and Equinox Club. Notable champions include Matt Parziale, Brad Faxon, James Driscoll, JJ Henry, Ted Bishop, Fran Quinn and Bill Andrade. 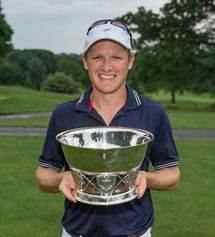 Champions receive an automatic exemption into the Northeast Amateur Championship and the event is recognized by the World Amateur Golf Rankings (WAGR). 2018 marks the 21st year of competition for the New England Senior Amateur Championship. The 36-hole championship is comprised of a 120 person field and hosts two divisions, a Senior (Age 55+) and Super Senior (Age 65+). Three sectional qualifiers are held as a prelude to the Championship Proper. Premier venues have included clubs such as Eastward Ho!, Rutland CC, Wallingford CC, Metacomet CC and Vermont National CC. Notable past champions include Ed Fletcher, Paul Murphy, Paul Quigley, Dave Szewczul, and Phil Pleat. The New England Junior Invitational, in its 49th year, hosts teams of junior golfers to compete in a team and individual competition. Seven of the top junior golfers from each of the six New England states are chosen by the state golf association to compete for their respective state. The championship recognizes both a 54-hole team and individual champion, where the team title is determined by totaling the best five of seven scores from each team. This all expense paid opportunity is unlike any other junior event in the country. The team, competitive environment and recognition from the American Junior Golf Association (AJGA), World Amateur Golf Rankings (WAGR) and Junior Golf Scoreboard (JGS) make this event one that the best players in the Northeast strive to compete in. In hosting our three major championships, the NEGA has collected over 700 emails from recent past participants. Our broad geographical coverage and partnership with the six New England state golf associations gives us accesses to potentially reaching thousands of golfers and hundreds of member clubs and facilities across New England. Your organization’s brand and merchandise will be on display in front of hosting member clubs. We can customize a package that fits your organizations needs to give you the best opportunity for exposure.